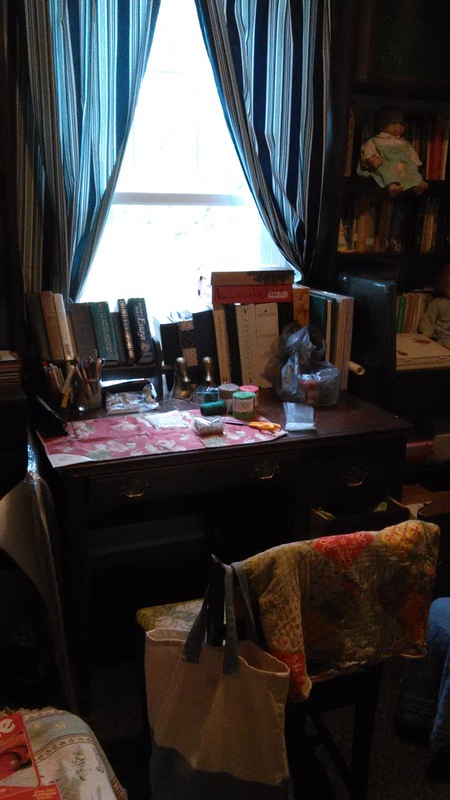 I set up a small space in the back office to work on my soap business, Red Robin Soaps. This room is full of books and toys and is supposed to be a restful, quiet place for children to play or anybody to read or rest. Anyway, I'm pondering a change to my soap packaging. 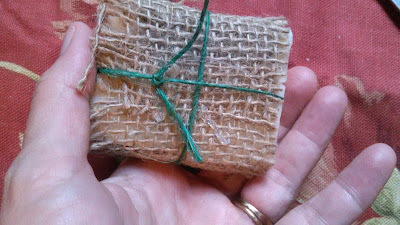 At the advice of the lady who runs a small gift shop where my soaps are carried, I bought some burlap strips and twine, hoping for a more natural look. I've sold my soap naked -- with no packaging at all. I've also wrapped it in fabric and twine (which slipped off). Later, I opted for little plastic bags with hand-written cheapo labels. They look better than this -- this one is a bit mangled. Soap must be exposed to the air for about a month after it's made, so it can cure (dry out). After that, I like it to be in a plastic bag, so the scent is preserved. The scent (especially lavender) tends to dissipate, and after a few months the soap just smells like ... soap. So, while this looks pretty cool and natural, after a while this lovely bar of tea tree oil soap won't smell like tea tree. Which is a problem. Customers like a scented soap to smell like itself. That's a very plain burlap look, simple. Here's the back. I'll keep fiddling with it. 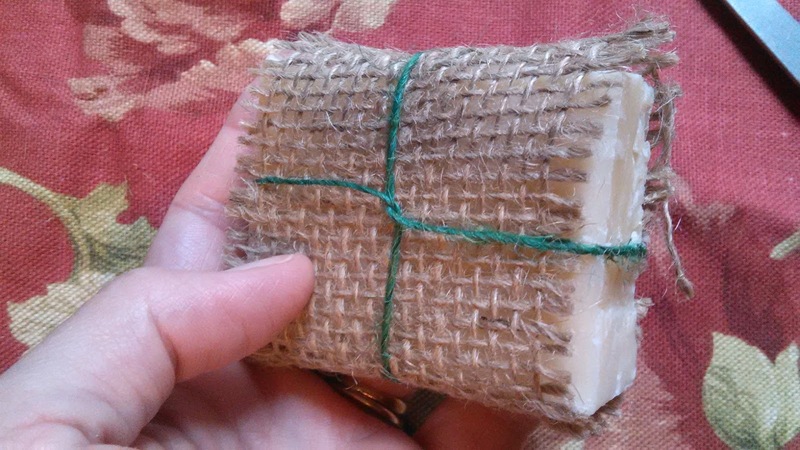 One solution is this: after wrapping in burlap and twine, to put each bar into a small plastic sleeve. A friend gave me a few of these to try. What do you think? 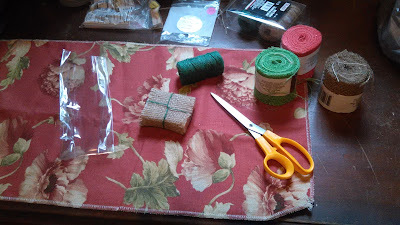 I could affix a new label either to the burlap/twine (under the plastic), or to the plastic bag itself. Which do you think is better? Should I use the plastic at all? I wouldn't have to seal the plastic really; I could fold it over, or place a bit of tape on the back. I could also leave the plastic off altogether for just the little gift shop, since she wants a natural look. Advice needed from readers! I buy sheets of labels that are blank, round circles. They are stickers. Then, I've had a couple stamps made through etsy makers that list my soap ingredients and website. I use the small plastic bags from Michael's (treat bags I think) and then use the sticker/label to fold over the bag and close. I like your burlap! I like the look of the fabric and twine best, but the burlap and twine are nice too. For the shop I would skip the plastic. I think it detracts from the soap. For mailing I would use the plastic and put the label on the back. I have no advice, but I am impressed. Your soaps look wonderful. Dear M.K. 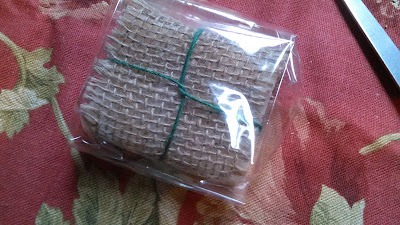 ~ I like the 'fabric' wrapping with the twine because you can see your soap, plus the little bird on it was sweet. I don't like the burlap covering the whole bar of soap. You could cut the burlap down the length to make narrower pieces, do you know what I mean. 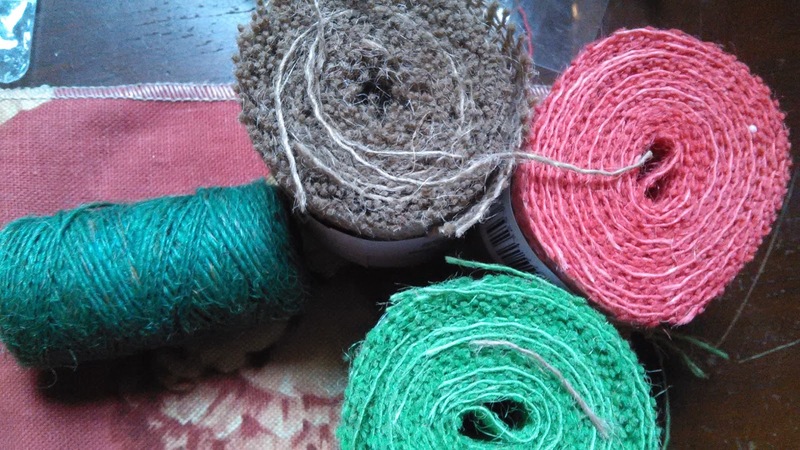 Tie the twine like you did on the burlap, but make the knot at the intersection of the two pieces of twine. By connecting the two by tying one piece around the other, then make your knot. Does that make sense? I think your soaps are lovely and they should be seen. 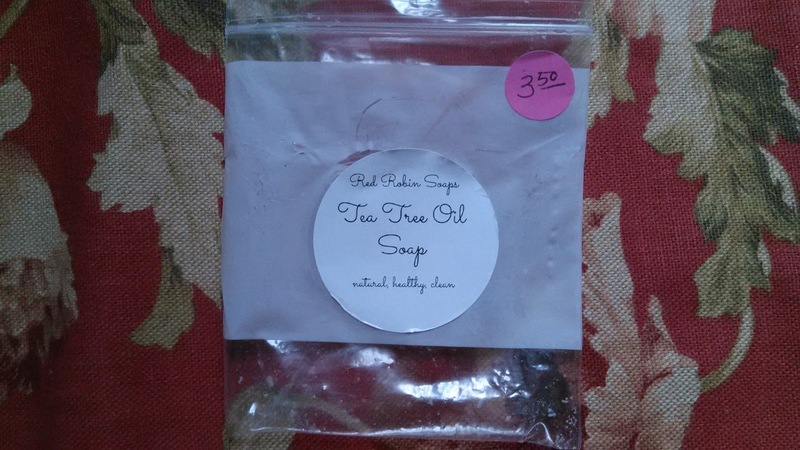 Soaps do lose their scents after awhile and to me that is always a bummer. Just my humble 2 cents worth. I like your sweet work space. I read this post and then went outdoors to do some work and thought about your soap wrappers and had, what I think, was a pretty fun idea. What about using a paper coffee sleeve for a "wrapper." You could get a cool rubber stamp or address label-type stamp or custom label (from Vistaprint.com) to apply your business name and/or product info directly to the wrapper. The self-inking stamps can be personalized and are economical these days. I'm sure there are some freebie labels and such out there to be had too. You could then put your soaps in a cello wrapper with a sticker holding it shut. Have fun with it! I'm sure there are many ways to make your soaps look earthy and natural. Good question. I tend to think burlap has a smell all its own (not one I prefer) so wondered if it left that burlappy scent on your soaps? The plastic makes sense, preserving the fragrance of the soap itself. A dilemma for sure.